Liberty quarterback Tyler Newman, seen throwing a pass against Coronado, leads the area with 3,108 passing yards and 35 TDs. The Patriots have moved from a run-heavy offense to one that features more passing this season. Liberty's Deseon McQuaig (22) seen jumping to catch a pass over Silverado's Daniel Savage (21) earlier this season, has emerged as a big-play threat for the Patriots. McQuaig has 37 catches for 774 yards and 10 TDs. For the past few seasons, Liberty’s football team has employed a power running game to become one of the area’s top teams. But there has been a change in identity this season. The Patriots have turned to the pass, and the results have been good. Senior Tyler Newman has emerged as the area’s leading passer and leads Liberty (8-3) into a Sunrise Region semifinal game against visiting Canyon Springs (9-1) at 7 p.m. today. Newman has completed 63.7 percent of his passes for 3,108 yards and 35 touchdowns. 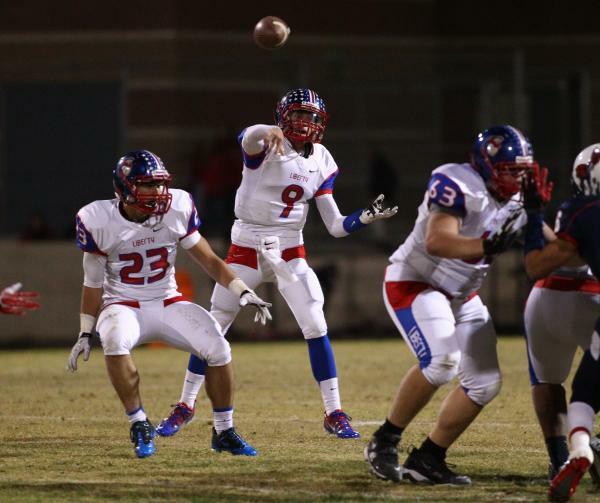 He has thrown just eight interceptions, and had a nine-touchdown performance against Del Sol. The Patriots have thrown 280 passes and run the ball 274 times. That’s a far cry from Liberty’s old ground-and-pound philosophy. In 13 games last season, the Patriots attempted 188 passes while running the ball 450 times. Deseon McQuaig has emerged as the team’s big-play threat, with 37 catches for 774 yards and 10 TDs. 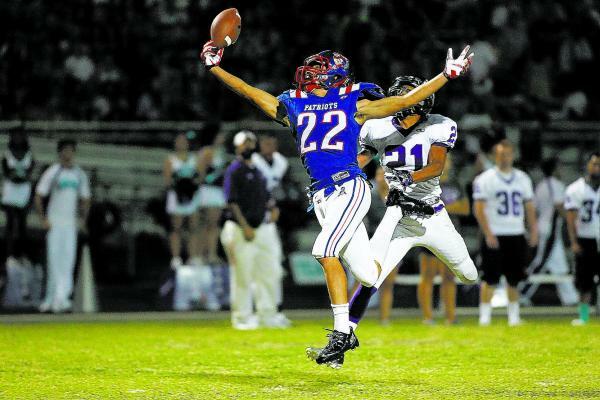 Drew Hladek has 40 catches for 646 yards and seven TDs for Liberty, which has five receivers with 19 or more catches. Muraco said the team still can move the ball on the ground. But no back is going to put up big numbers. Brenan Adams, Ethan Tuilagi, Calvin Tubbs and Tyler Parvin have combined to rush for 1,358 yards, but none averages more than five carries a game. Liberty has averaged 40.6 points and scored 50 or more four times. But that high-powered offense runs into a Canyon Springs team that has yielded an average of 13 points. The team has two shutouts, and 44 of the 130 points the Pioneers have allowed came in a one-point loss to Green Valley. The Patriots have won seven straight after a 1-3 start that included losses to three tough out-of-state teams. That experience has the team confident. “No one in Vegas is going to compare to what we’ve already been against, so we’re prepared for whatever comes ahead of us,” McQuaig said.